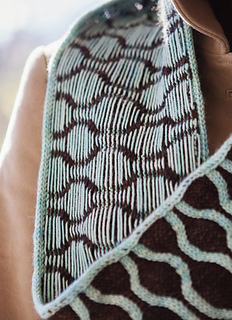 Strikingly graphic, and easy to create, this cowl is a stunning example of two-color cables. 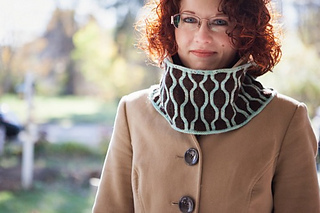 An i-cord cast on and bind off beautifully frame the stitches and add to this appealing cowl. 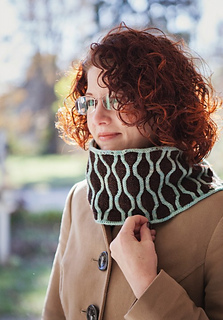 Mix things up and make it taller, or change up the stitch count and make it double length!It’s easy to make and gorgeous to wear. Shown in Blue Ringed Octopus and Bess Beetle. About a half skein of each. 2/1LCp - Slip next 2 sts to cn, hold in front, p1, k2 from cn. 2/1RCp - Slip next ss to cn, hold in back, k2, p1 from cn. I-cord cast on - Cast on 5 sts. Rnd 1: K4, kfb. Slip 5 sts back to left hand needle. Repeat rnd 1. I-cord bind off - Cast on 5 sts. Rnd 1: K4, k2tog, slip 5 sts back to left hand needle. Repeat rnd 1. Bind off your I-cord sts. How to work a 7-stitch float - Work your 7 purl sts, and arrange them evenly across your right hand needle so they’re not bunched up or stretched out. 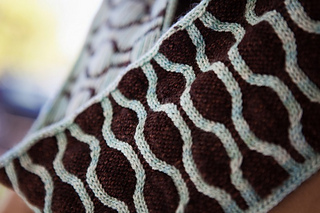 Gently bring your MC yarn across the 7 sts without pulling and work your knit stitches. 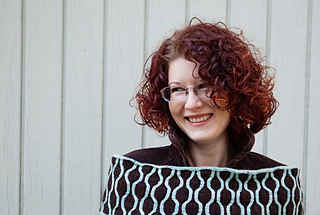 The float should rest against the purl stitches without being too loose or too stretched.